Fabricated the control stick and torque tube. The tube mounts via rod end bearings to the fuse crossmembers. This is what builders of plans-built aircraft spend a lot of time doing....staring at the task at hand and mentally running through options. It doesn't take much time to come up with a solution, but it may take much more time to resolve the simplest, most minimal design which is nearly always the best solution. There isn't much guidance on fuel tank mounting in the D.VII docs, just the suggestion to use foam pipe insulation as shock absorbers. The trick is to come up with a simple design that allows the tank to be easily removed but still safely supports eleven gallons of gas without compromising the tank. Here is the forward tank floor support I decided upon. While rummaging through my box of scraps, I found a piece of left-over 1.25" 6061 with a part number from my first homebuilt project over twenty years ago, a Fish Super Koala. I chuckled at the irony of flying a part of that long-gone aircraft in the Fokker. The tube was coped for a tight fight to the fuse upright, riveted with a couple of .187" steel rivets, then a gusset added for additional security. This tube can be permanently fixed because the tank can be slid back enough to clear this tube. The other tank support is a left-over length of 1/2" 4130 from previous projects (never throw anything away!). Because this support must be removed in order for the tank to drop out, it is secured with AN-3 bolts. Final version will have a full length piece of automotive rubber tubing as a shock mount. 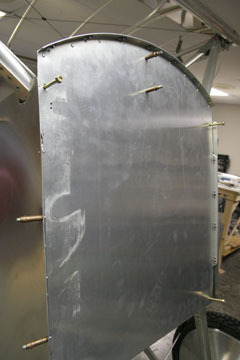 I'll also weld on tabs that will capture the rear corner of the tank to prevent it from sliding backward. The steel tube is heavier than aluminum but allows me to use smaller diameter to prevent interference with the pilot's toes. In totality, the tank installation looks pretty good. The pipe insulation wedges the tank into place and my bottom supports hold it tight up against the fuse members. 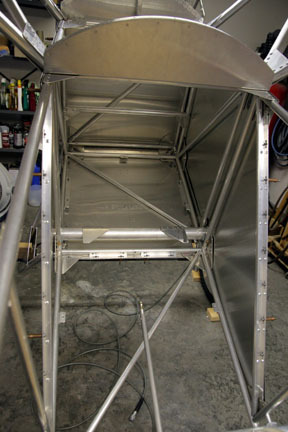 Removing the side panels will result in good access to the tank if it needs to be removed. 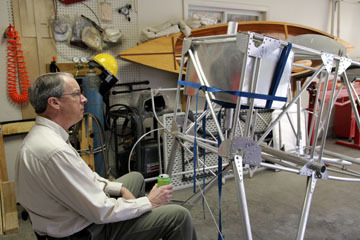 Earlier in the day I fabricated the instrument panel and firewall. I'm waiting on new turtledeck and side panel sheets to replace those damaged in shipping. 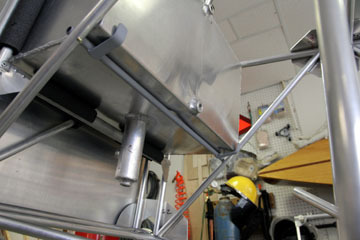 Rear tank support with straps welded in place to prevent tank from sliding back. They will be padded during final installation. 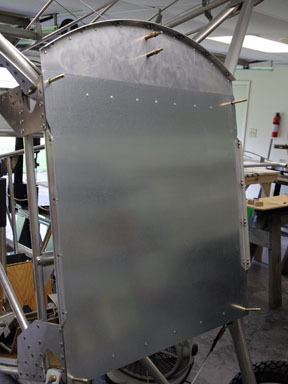 After establishing hard mounting points for the forward fuse sheet metal by installing a ton of K1000-8 nutplates, the firewall, side panels and belly pan are in place. 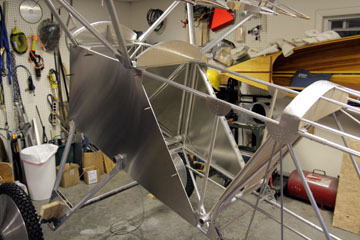 Aluminum angles were riveted to various fuse tubes to carry the nutplates. 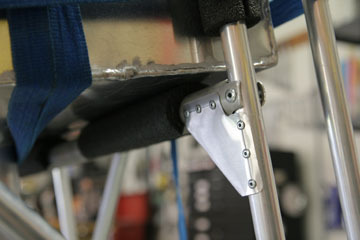 The nutplates were installed with squeezed flush-head rivets so the panels will lie flat against the angles. I installed a belly pan so the fuse can be opened up for service--it should also stand up better to engine residue than fabric. 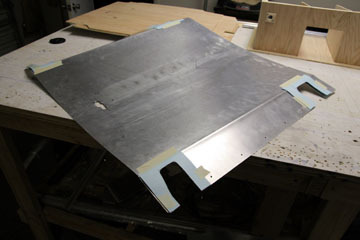 Aluminum angle was cut with saw kerfs so it would smoothly follow the contour of the instrument panel and carry nutplates to attach the turtledeck. Same thing with the firewall. Close to 50 nutplates have been installed so far but they will pay off with ease of service access when the time comes for the condition inspection. The firewall shipped with the kit is 6061 aluminum which offers practically no protection for the fuel tank if there is an engine fire. After pondering this for many weeks I decided I needed a real firewall. A 24" x 24" piece of 26g (0.022") galvanized steel was purchased locally and a new firewall constructed. 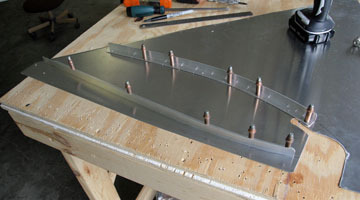 I retained the upper portion of the original firewall because I had already fabricated the bowed angle with platenuts. The steel extends above the tank and satisfies my concerns. We picked up a pound or two of weight but this won't matter if the firewall is ever called upon to do its job. 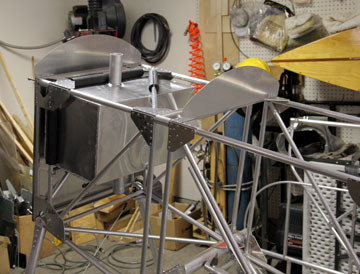 Looking more like a D.VII with the sheet metal in place. Figuring out how to sequence all the panels so they can be removed from the finished aircraft is an interesting mental exercise. It is necessary to think from the inside to the outside to avoid boxing in something that won't come out later. Getting the deck panel measured, cut, and fitted is a major milestone. Here is the scrap sheet of aluminum used for trial fitting. It then was refined with paper masks to make a pattern. 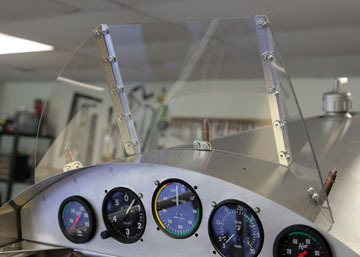 The challenge is getting a close fit around the cabanes and over the curved firewall and instrument panel....and putting the bends in exactly the right place. 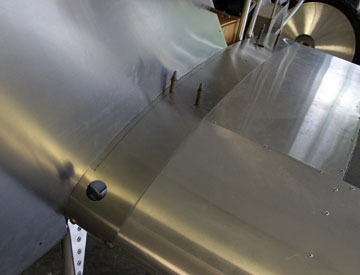 These angles were riveted to the fuse side panels so wing root fairings could be attached. 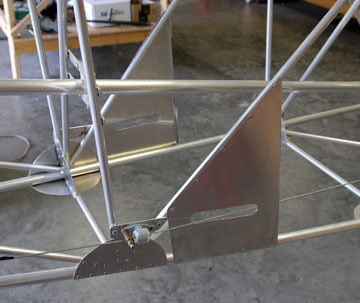 There is a gap in the angles so the side panel can be easily removed for service. 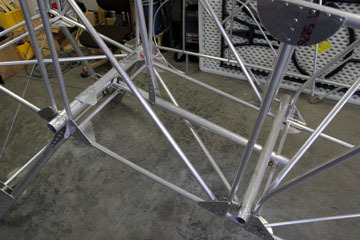 The rear angles will be permanently attached after the fuse is covered. 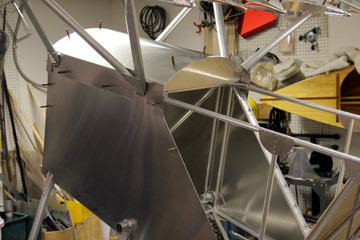 A finished root fairing. 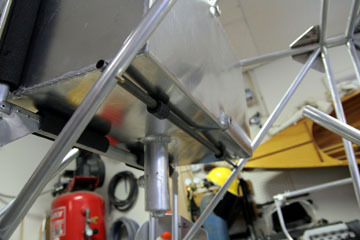 A pair of 1.5" holes allow the lift wires to attached to the lift tangs. The D.VII didn't have a windscreen but I want one to prevent collisions with hard-shell bugs. 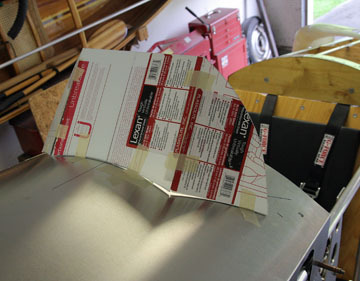 A couple sheets of Lexan were mocked up for a simple windscreen with careful measurements and a cardboard template. 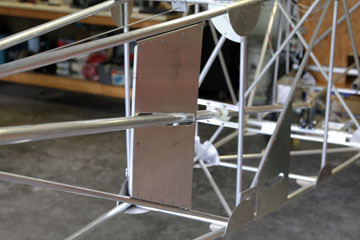 Aluminum angles and brackets were fabricated and all the pieces attached with 1/8" rivets. 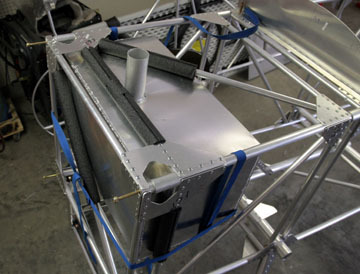 This screen is inexpensive and easily modified or replaced if flight test prove this one is ineffective. 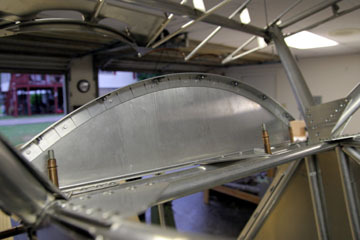 Here are exits for the rudder cables. This will provide a place to anchor fabric. Similar exit for the elevator pushrod.